Electricity is everywhere in charged subatomic particles that you can't see with your naked eye. Though it is difficult to see, it is continuously flowing through wires all around you. Just like electricity, magnetic fields are everywhere, as well. However, only items with magnetic properties, like magnets, will interact with the magnetic field. 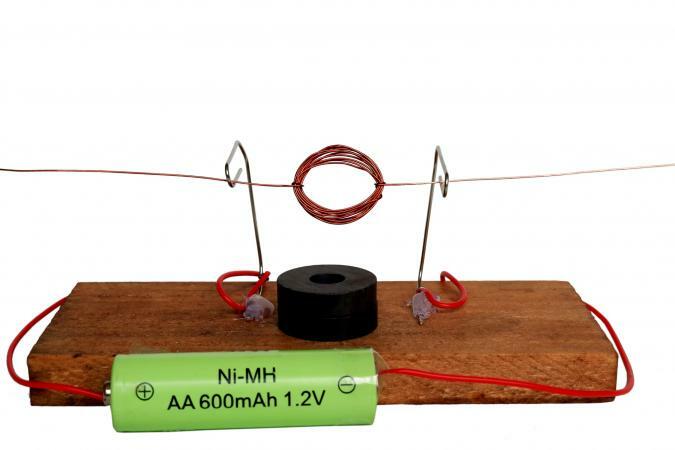 By using a simple battery and a magnet, children can see how electricity and magnets interact to make a propeller spin. This simple experiment is perfect for middle school children being introduced to physics for the first time. A simple electric motor is a great tool in teaching middle school aged children how electricity and magnetism can work together. By attaching magnet wire to a battery and placing it in a magnetic field, the current flowing through the circuit creates an electromagnetic field. The electromagnetic field then interacts with the magnetic field of the magnet, allowing the toy propeller attached to the shaft to spin. Place a safety pin on each battery terminal with the pin opening on the terminals. Note: You can also use paperclips. Place the rubber band around the battery lengthwise to hold the safety pins in place. Check to make sure the circle ends of the safety pins align with each other so the wire can run through the holes evenly. Cut a six-inch piece of magnet wire and mold it into a circle (about six loops) with a diameter of about one-half inch. Cut two, two-inch pieces of wire for the "tails." Scrape the enamel (coating) of the magnet wire off the top of the "tails" to expose the copper wire inside. Leave the enamel on the bottom of the wire. Attach each exposed piece of wire to either side of the magnet wire circle. Slide the tails of the magnet circle piece into the small circle at the end of the safety pins attached to the battery. Attach a small toy propeller to one end of the wire end. Place a block magnet next to the battery. Position the battery so the magnet wire is above the bar magnet. The propeller should spin in circles. If children do not scrap off about 50 percent of each of the magnet wire "tails," then the electricity will not flow through the wires and the propeller will not spin. On the other extreme, if children scrape off too much of the magnet wire enamel, the wire coil will only turn half way around and try to rotate back, ultimately getting stuck. Electromagnetism describes the relationship between electricity and magnetism. When an electrical current flows through a wire, it creates an electromagnetic field around the wire. The electromagnetic field is only around the wire when electricity is flowing through the wire. If the something stops the flow of electricity, the electromagnetic field will stop. When you place the "tails" of the magnet wire loop through the ends of the safety pin, you are creating a circuit. Since electricity is now flowing through the "circuit," an electromagnetic field is created around the wire. The electromagnetic field reacts to the block magnet's magnetic field by causing the wire coil to spin. The wire coil does a half turn because the two fields are acting against it. When the wire completes its 180-degree turn, it stops because electricity has stopped flowing when it hit the wire still covered with the enamel. The wire coil will still complete the turn because the stored kinetic energy of the wire will allow the flow of electricity to continue again. The pattern will continuously repeat on and on. Have children add a second block magnet above the wire coil to see what happens to the wire coil. Does it get faster or slower? You can also remove the battery and attach the ends of the magnetic wire to a LED bulb. Place the propeller in the wind and see what happens to the LED bulb. Electromagnetism is an important scientific concept to understand. It is used in many electrical appliances to generate desired magnetic fields. For example, you will find electromagnets in scientific and medical equipment like Magnetic Resonance Imaging (MRI) machines and particle accelerators. This simple experiment is just one example of how people can harness the power of electricity and magnetism.